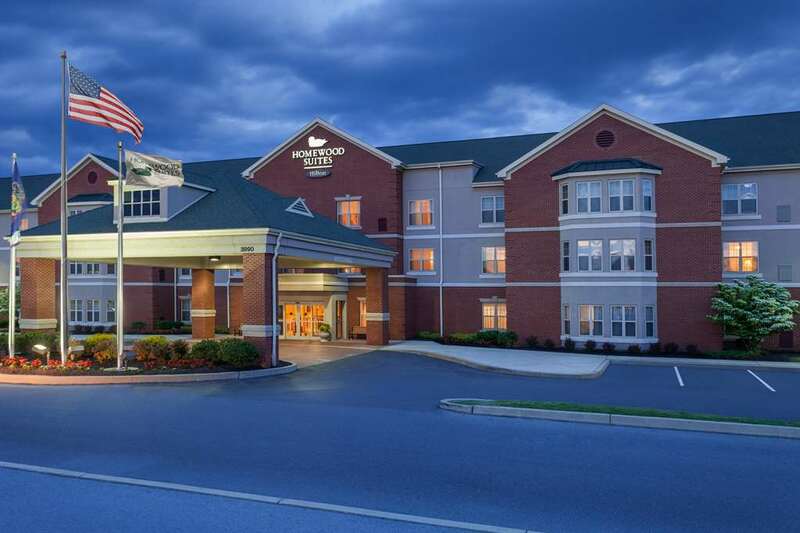 The Homewood Suites by Hilton Harrisburg East-Hershey Area hotel is located in Harrisburg Pennsylvania and truly has the extended-stay market down to perfection. Warm yourself by our cozy fire in our two-story lodge lobby the perfect gathering place for family or business associates. Choose from studio one and two bedroom suites complete with kitchen and living quarters. Each suite at the Homewood Suites hotel in Harrisburg Pennsylvania includes stovetop microwave refrigerator coffeemaker work table complimentary high-speed internet complimentary PrinterOn service TV hair dryer and iron and ironing boards. Start your day with the Suite Start hot breakfast buffet and end your work day at the Welcome Home reception featuring a tasty dinner Monday through Thursday with lots of warm and genuine Pennsylvania hospitality. At the Homewood Suites hotel in Harrisburg Pennsylvania you can relax in our indoor pool whirlpool on-site fitness center and off-site fitness center. Relax in the gazebo located in our courtyard featuring basketball and shuffleboard courts or hone your golf game on our putting green. Enjoy front-door access to Harrisburg*s 20 mile Greenbelt which provides beautiful parks and recreational activities. A 24-hour business center and Suite Shop are open for your convenience. Our Willow Room and boardroom at the Homewood Suites hotel in Harrisburg Pennsylvania will accommodate small and large functions. Whether you are traveling for business or for leisure it will be our pleasure to serve you with the most efficient and friendly service at the Homewood Suites hotel in Harrisburg Pennsylvania. Make Yourself At Home.